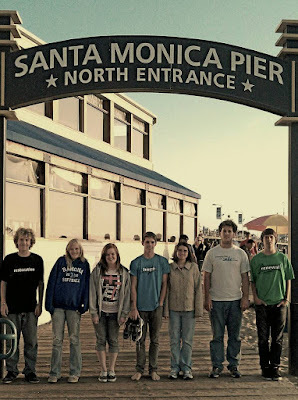 Yesterday our Mission Trip Team returned home to Ramona from our week in Los Angeles. It is good to be home but I can't help but miss that city. I think we all have places where we feel connected to God and connected to God's heart for the world and L.A. is just one of those places for me. Wherever I go, the people of those streets are never far from my heart. In some ways, that made this trip a bit more difficult than I excepted. The students who went on our trip had never been exposed to that side of L.A. before so, as is to be expected, they did not automatically share my passion and my heart for it. But it was a joy to share my heart with them and to show them the reality and the humanity of the city. To watch our students learn and grow more in love with the city and with the God who lives there was an incredible privilege. We took an amazing group of students! Now, I am miles away from being an urban missionary and I'm miles away from even being able to claim real experience, so it was a blessing to learn and hear from those in the city who really have a heart for the people there. We learned from their compassion and kindness. It turned out to be an incredible trip. I recommend CSM (http://www.CSM.org).